Although I love anything sweet, sometimes foods with sugar (even natural ones) set me off in the morning to crave more sweet food all day long. I enjoy taking traditional foods often served sweet and putting a savory twist on them, like oatmeal or muffins or this Dutch baby. I already have a classic Dutch baby recipe on the site and it is like a baked eggy pancake. 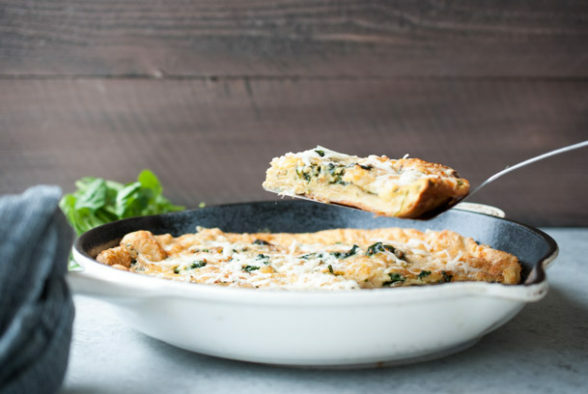 It’s really easy to make since you put everything in a blender and pour it into a preheated baking dish or skillet and bake. A Dutch baby usually puffs up in the oven and then deflates as soon as you remove it for some temporary drama. My kids and I love them with fresh fruit or a fruit sauce. This savory version was a huge hit in my breakfast class this spring. There is an extra step involved which is sautéing the vegetables, but you can do that the day before if you want. The Gruyere makes this feel so rich and decadent, but it’s very little. A little goes a long way! A couple of my students served this to their families for dinner as well as breakfast and brunch, which I think is a great idea either with or without a green salad. 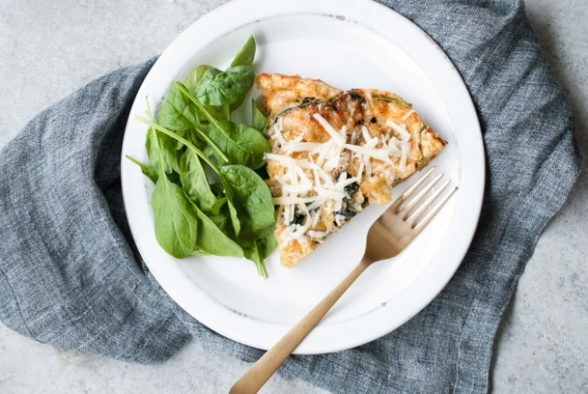 For those of you that are comfortable ad libbing in the kitchen, you can swap out the spinach and onions for other ingredients, as long as they are cooked ahead of time, such as roasted cherry tomatoes or kale. Note that this will not puff as much as a traditional Dutch baby because the batter will be weighed down with veggies. That’s why if you leave a 1-inch border empty around the perimeter, the edges can still puff up. For those of you who are reading this before 8:00 am today (Friday), I’ll be on The TODAY Show int he 8:00 hour, usually closer to 8:40 am. If you’re in the Dallas area, come by The Gem on Forest Lane on Monday from 10:00 am to 12:00 pm for a cooking demo and booking signing. It’s a free event and I’d love to see you! 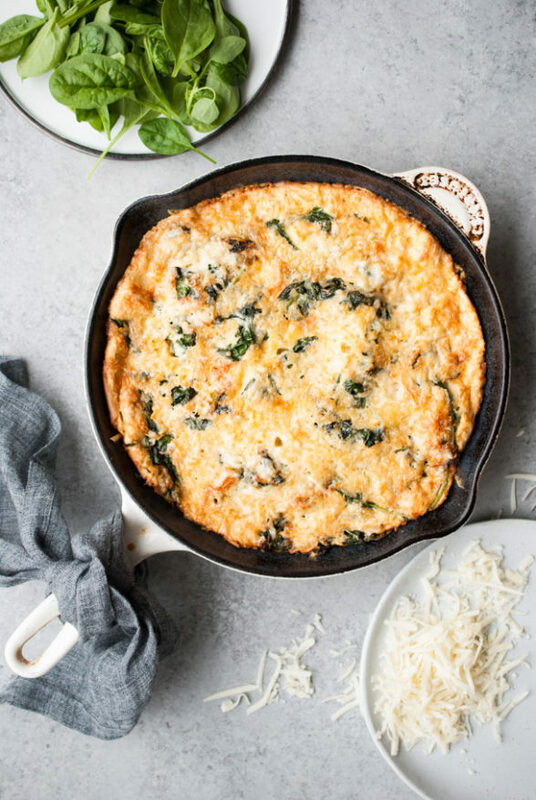 Preheat the oven to 425 degrees and put a 9- or 10-inch oven-proof skillet in the oven. Heat 2 Tablespoons avocado oil in a separate medium skillet over medium heat. Add onion and sauté until caramelized, about 15-17 minutes, lowering the heat as necessary. When the onions are golden, turn the heat back up to medium and add the spinach, season with ¼ salt and pepper, and cook until wilted, about 3-5 minutes. Meanwhile, add eggs, milk, flour, and ½ teaspoon salt to a blender and blend for 1 minute. Remove hot skillet from the oven and carefully add the remaining 2 Tablespoons of avocado oil. Pour batter into the skillet with the avocado oil and (using an oven mitt). 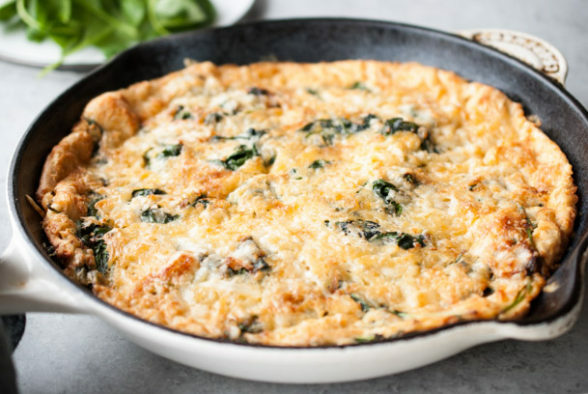 Arrange onions, spinach, and cheese on top of batter leaving a 1-inch border around the edge of the pan without any vegetables. Bake until puffed and set, about 25-30 minutes. Serve immediately with desired accompaniments, such as a crisp green salad with a vinaigrette or roasted asparagus or sautéed mushrooms. Room temperature ingredients, as well as whole milk and all-purpose flour make the pancake rise the best. But it will still turn out well with whole spelt flour and almond milk. Does this taste good heated up the next day? Or does it need to be eaten day of hot out of the oven? I’ve eaten the sweet Dutch babies out of the fridge cold. I would reheat the savory one if you are eating leftovers. Amazing fresh out of oven! Doesn’t look as pretty, but still tastes great warmed up the next day Do you think adding sautéed mushrooms would make it too thick and chewy? Great! Slice the mushrooms really thin and saute them well ahead of time to get rid of as much moisture as possible so they don’t weigh down the batter too too much. I made it tonight. I used kale, ghee,and all purpose flour. It turned out so delicious! perfect and so easy to make. Nice pictures Pamela! looks delicious can’t wait to make.